Let me share my experience in 1st Puzzle Meetup in Bangalore on 31st May, 2015 @ RMZ Infinity, Old Madras Road. In fact this was 2nd meeting of such kind in Bangalore. First time we met to solve puzzles was around more than 4 years back when many puzzlers in Bangalore met @ my home to solve a LMI Puzzle test offline. Yesterday's Puzzle meeting in fact was more than just solving puzzles. More details about the meeting can be found at LMI forum. 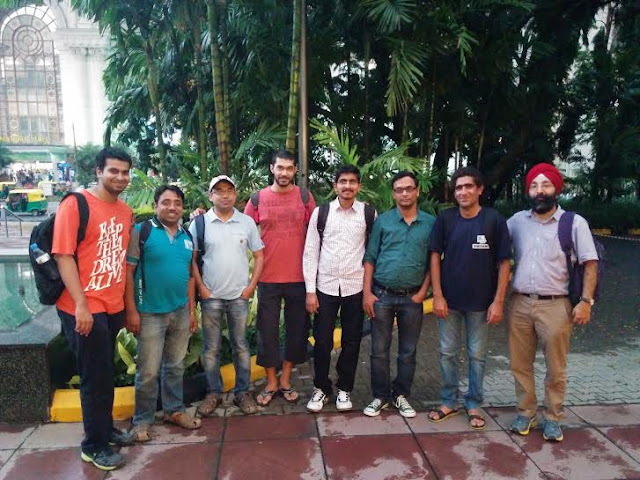 This meet was attended by 10 Puzzle enthusiasts Amit Sowani, Deb Mohanty, Aditi Seshadri, Prasanna Seshadri, Harmeet Singh, Rohan Rao, Sai Karthik Burra, Gaurav K. Jain, Rishi Puri and myself. Karthik and Aditi are new comers in puzzle world and youngest ones who attended this meet while Rishi specially traveled from Hyderabad to Bangalore. Below is one of the picture we took once the meeting was over. Aditi Seshadri and Amit are missing in this picture as Aditi left early and Amit clicked this photograph. Before this meeting started, my expectations from the meeting was that we will try to solve the puzzles which someone is not able to solve and try to find the logical path to tough problems. However this meeting turned out to more than just solving puzzles. Meeting starting with solving the tough problems. I was having printouts of many puzzles which I was not able to solve logically. One of my favorite one being a big Slitherlink puzzle which I was not able to open this puzzle logically. Prasanna helped me to proceed with this puzzle. While we all were busy helping each other then Amit announced that we are going to solve one Team round. So we were divided into two teams. In one team it was Rishi, Rohan, Aditi, Harmeet and Deb and other team we were Prasanna, Gaurav, Karthik, Amit and myself. Both the team were good mix of experienced as well as new players. We were given a team puzzle consisting of four Sudoku puzzles linked to each other. In this puzzle good Team efforts were required to solve this puzzle completely. Time given to solve this full puzzle was 45 minutes. As there were 4 Sudoku puzzles Gaurav, Prasanna, Karthik and myself took one Sudoku to solve while Amit took the hard part of co-coordinating among team members and helping each one of us. Without revealing much about this puzzle I will say that this was very enjoyable exercise and good learning solving puzzles as a team. Fortunately after recovering from few initial errors our team was able to solve this puzzle completely well within allocated time. Next agenda for the meeting was learning to create puzzles. Among 10 of us there were 4 people who has never created puzzle in their life while other 6 was having experience in creating puzzles. So each experienced person clubbed with new comer to make 5 teams of 2 people. In fact two experienced played Amit and Rishi clubbed together to create something big/good. Each team was given one Sudoku type to create. Here again I will not reveal much about the Sudoku types created by us as may puzzles created during this meet may appear in one of the forthcoming LMI Puzzle/Sudoku test. I was teamed up with Harmeet for creating puzzle. It was great experience working with him to create some Sudoku puzzles. At the end Harmeet was able to create one good Sudoku puzzle and I am hoping that in we will soon see more puzzles creating by Harmeet in future. Similar was the case with other newcomers. I am sure that now we will have some new puzzle creators coming from Bangalore. 1. Team Rounds were very enjoyable. We plan to continue with team round in the future meetings. 2. Creating Puzzles again was great idea which will be continued in future meetings. However empty grid needs to brought to the meeting which will help in creating puzzles. 3. Venue of the meeting looked good and will continue until we have any better place. 4. Time of meeting was discussed. Date and time needs to be communicated well in advance of 2 weeks, so that anyone attending the meeting can plan better. We are hoping to have meeting every month in Bangalore and hopefully it will happen in other cities also. Looking forward to meet all the puzzle friends in Bangalore at next meet in June 2015. I tried to post most of the information which I remembered. However I may have missed many things. If someone who attended this meeting is reading this, please do post your comments about this meeting. Looking forward for next meet, will try if possible to attend. It will be great to have you in the next meeting. It will be great to see such meetings happening in other cities also. In fact it was Prasanna's Team which completed this round. Other team was not able to complete this team round.